I'm sure I am misunderstanding something about Unity vectors or something here. I am brand, brand new to Unity so this is part of the problem. I am trying to make a simple atomic model and I am trying to model valence electrons. 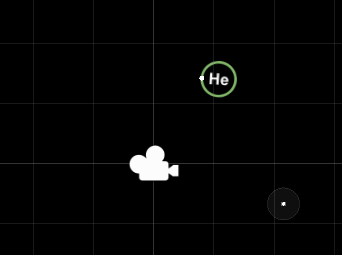 I've got a game object with two children - the symbol (which is working perfectly), and a child electron. If an atom has more than 1 valence electrons, I add those as additional child objects. All of this is working just fine - except for one part. I have a default position for the original child valence electron, but when I try to add additional children and set their positions, they're not anywhere near where they should be. I've tried Vector2 (currently shown above), a new Vector3 in transform.localPosition (shown and commented out), as well as in transform.position (not shown, but similar to localPosition). What exactly am I doing wrong here? I am strongly guessing that I am misunderstanding the vector math or something here. So the answer was that I needed to set the localPosition after setting the parent. I thought everything was correctly calculated at runtime (taking parental relationships into account), but apparently if you set the localPosition before setting the parent, it does NOT take the future parent into account at all, and uses another reference point (I assume the origin?) to generate the position. Not the answer you're looking for? Browse other questions tagged unity 2d objects or ask your own question.